If you return to your home or photography studio and discover it has been burglarized, then your very first step is to make sure the burglar(s) have left. You don’t want suddenly to corner a desperate person. If you can’t be sure the burglar has left, then leave the premises immediately. Go to a neighbors or other secure location. Call the police as soon as you are safe, in your home or at another location. If it is safe to be in your home or office, then start to determine what has been stolen. Try not to move or touch anything, so the police can see exactly how the premises looked when you arrived. You can clean and straighten the mess later. If you prepared a list of your possessions’ serial numbers (including your camera equipment), then retrieve it from where it is kept. (A printed copy of the list is a smart idea. If you only store it on your computer, and the burglar took the computer, then you can’t provide that information to the police!) If you took photos of your equipment, then show them to the police too. It’s likely the burglar didn’t just steal photography equipment. As well as checking for missing electronics, jewelry, cash and other valuables, take a look at the location where you (hopefully) keep your equipment secured and locked. Notice how the burglar may have entered your home or office and show the entry point to the police. Greet the police in front of your home or office. Don’t remain inside, as they could think you are the burglar. While you’re waiting for the police, you can also call your insurance company’s 24/7 hotline. You want to be sure to inform the company of the burglary as soon as possible because most policies require the submission of your claim within a short period of time, such as a week. Your insurance company may schedule a claims specialist to visit you to assess the burglary. If you gave your insurance agent a copy of the list of serial numbers, then remind him or her. Have a copy of the list and any photos or videos ready for your meeting with the claims rep. He or she will likely want to see the point of entry to determine if you can claim any repairs to your home. If you rent space for a photography business, then the property owner’s insurance would cover those repairs. It’s probably a good idea to call, as soon as possible, the property management company or owner of the commercial property where you operate your photography business. He or she will want to inform the insurance company that covers the building of the break-in and any damages. Regardless of how the burglar gained access to your home, you’ll want to hire a handyman or other qualified individuals to change all the locks on your doors and any window or other locks the burglar may have picked. Ask the commercial property owner to do this for your photography studio. If you’ve kept your photography equipment in a cabinet with locks or padlocks, then change these too, even if your equipment wasn’t stolen. There may be other items the burglar didn't take the first time, and could return. 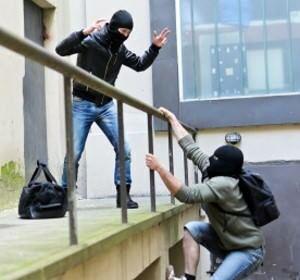 Since FBI crime statistics show that only 12.4 percent of burglars are ever found, arrested and convicted, it is likely the items stolen will not be recovered. Of course, deterrence is the first line of defense. If burglaries can’t find your photography equipment and it is too well secured to spend the time necessary to grab it, then when your home or office is burglarized, your equipment will still be there.